Enter the Christmas Food Garnishing Contest 2016 with the original Christmas and New Year themed food idea, and win a money prize. Are you a baker, carving artist, sweet/chocolate designer? Amateur or professional one? You are welcome to take a part in the competition and be awarded with some money. 1. 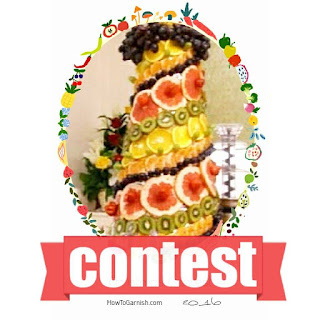 You are the author of the submitted food centerpiece. 2. The food centerpiece is Christmas and New Year themed decorated. It could be a dessert, cake, cupcakes, salad, sandwiches, fruit and vegetable display, plating art, food sculpture, or any idea with edible materials. For Further Details just click on this link and go to the main page of the contest to register and take your chance at the win! A MERRY CHRISTMAS AND A HAPPY NEW YEAR 2017 TO COME! GOD BLESS!